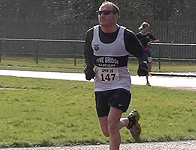 Congratulations to Rob Kirtley who flew the flag for Tyne Bridge Harriers by running the ‘undulating’ 20 mile course of the Spen20 hosted by Spenborough & District AC in and around the West Yorkshire countryside of Cleckheaton on Sunday 13th March. The course has some tough sections both in ascent and descent throughout. Rob was using this race as one of his final long training run for his upcoming London Marathon effort on April 17th and finished with a respectable time of 2:47:10.